This book contains more than 135 dyno charts, including 75 before-and-after tests to help readers choose the best high-performance parts. This book is like having 150+ different magazine articles on Gen 3 V8 dyno tests all in one place. It's hard to argue with the convenience and value of that. Another attractive feature of this book is the way each dyno tested product is covered. Each story is two-pages long with text on the left and images and charts on the right...very orderly and easy to read. A wide variety of popular modificationsâ€“intake throttle bodies, intake manifolds camshafts, cylinder heads, headers, superchargers, turbos and nitrous oxide injection systemsâ€“for GM LS1, LS2, LS6 and some Gen 3 truck engines are covered. Most of the parts mainstream modificaitons from name-brand manufacturers rather than obscure items from sources of which you've never heard. 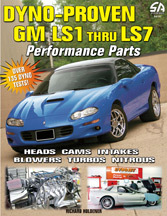 The way Dyno-Proven GM LS1 Thru LS7 Performance Parts reads and Author, Holdener's, background as a magazine writer has us of the opinion that some of the chapters in this book are rewritten or re-edited magazine pieces. If your not a regular reader of Mr. Holdener's magazine content, that's no big deal, but if you're a regular reader of magazines which cover the GM LS-series engine, you might feel a little miffed at paying for a book containing material you've already read. The book's title implies it contains material on the LS4â€“there is none. Also, contrary to the title, there is no impartial testing of anything for the LS7. There is test of a C6 Corvette Z06 exhaust system, but the test information was supplied by the system's manufacturer which makes the data suspect. Richard Holdener is quoted at the beginning of the book as saying, "I've always questioned the advertising claims in the performance magazines." Based on that, his use of data developed for advertising by the exhaust's maker seems strange. While we liked the idea of testing so many different modifications, our biggest complaint about the book is the majority of the tests are done with different engines so the reader has no ability to compare similar modifications on the same engine. In spite of some reservations I have about this book, Dyno-Proven GM LS1 Thru LS7 Performance Parts, it is is currently unique in the Gen 3/Gen 4 technical book market for its subject matter and how it's approached. As a result, I characterize it as a "mixed-bag"â€“great if you haven't read the stuff before and you're interested in modifying LS1/2/6 engines. Not so good if you read a lot of magazines, you're looking for information on the LS4 or LS7 engines or you want to compare effects of similar parts from different sources.